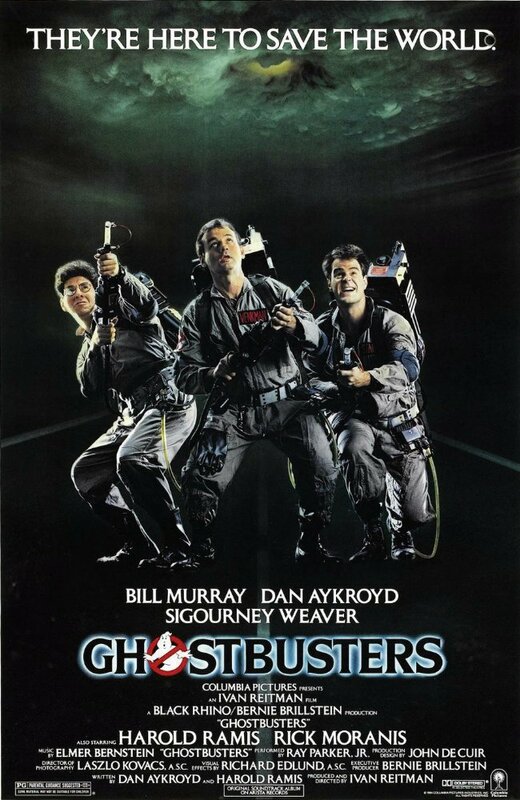 A team of paranormal scientists (Bill Murray, Dan Aykroyd, and Harold Ramis) hire a secretary (Annie Potts) and open a business to help rid New York City of its ghosts. But when a beautiful client (Sigourney Weaver) and her nerdy neighbor (Rick Moranis) appear to be possessed by ancient spirits, the Ghost Busters — joined by a new employee (Ernie Hudson) — find their work suddenly much more urgent. Peary writes that this “amusing diversion” which “somehow became one of the biggest box-office successes of all time” is as “zany and irreverent as expected and the special effects are a lot of fun”, but he argues that “the self-impressed dialogue seems forced and feeble”. He concedes that “Murray has a field day — he provides most of the wild hilarity”, but notes he wishes “audiences weren’t so easily charmed by his rude, childish, chauvanistic characters simply because they hint that they are only playacting”, and that he believes “this Murray character is really a jerk with whom we shouldn’t laugh”. Interestingly, while I find Murray insufferable most of the time, this is the one Peary-listed film where his antics and deadpan delivery seem to fit perfectly: what else should one be but calm, cool, and snarky in the face of existential paranormal crises? Sure, his character is a boorish and womanizing cad, but his super-smart colleagues are busy rocking it in their own way, and Weaver more than holds her own, especially when she gets to face off against Murray supernatural-style. Speaking of Weaver, she has immense fun with her role, and looks stunning even when — or perhaps especially when — possessed. The special effects are surprisingly effective for a film of this era, and excellent use is made of New York City sets. Meanwhile, the entire storyline of ghosts being captured and held in electronic captivity couldn’t resonate more aptly with our modern-day concerns over digital security; the film is almost prescient in its depiction of evil forces itching to take over the world, let loose by bumbling bureaucrats (in this case, a clueless EPA employee played by William Atherton). Film fanatics should enjoy checking out — or revisiting — this iconic ’80s cult favorite, which has held up well as a silly horror-comedy. Yes, as a fun cult favorite. Taking a contrary view here – and it puts me in something of a minority since many do seem to have maintained a fondness for it. But it’s not must-see. I saw it again not that long ago – quite possibly for the first time since its release. I was actually looking forward to the rewatch, since my memory of it seemed a positive one. I was surprised that I found it somewhat tiresome. I wondered why my memory of it was better. All I can figure is that, when I first saw it, I was caught up in the novelty of it and allowed myself to go with that. Or maybe I was in the mood for something extremely silly that night and my expectations were low. But, seeing it again years later – though I think there’s an occasional funny moment here and there, I don’t think it’s much of a comedy. Since I was paying more attention to the actual script this time, I didn’t notice much wit. The script seemed kind of a mess, overall. ~though I will say I did gradually (later) begin to take more of a liking to Bill Murray elsewhere, when the roles and the scripts were better and/or funnier (i.e., ‘Tootsie’, ‘Little Shop of Horrors’, ‘Groundhog Day’, ‘Ed Wood’). But Weaver (who I tend to like) was a particular disappointment. Her character, for example, has absolutely no interest in Murray and finds him annoying (as she should)… until… he gains notoriety. THEN suddenly she can’t get enough of him (?!). Eww…. As I said, certainly plenty of others will disagree with my take on this. It seems that, for me, since the novelty was over (when I saw it in the ’80s), I noticed too many distracting faults to find it a memorable experience. I had the opposite experience as you with this one! Goes to show that some movies really do impact us in different ways at different stages in our own evolution as viewers. For me it’s (usually) more like – if it doesn’t stand the test of time, it’s not must-see.